Enjoy a special Christmas celebration this year with a 3-hour dinner cruise on the San Francisco Bay. Sip Champagne, and enjoy festive holiday music while taking in the San Francisco skyline from the water, the Golden Gate Bridge, Transamerica Pyramid, Alcatraz Island, Coit Tower, and other top San Francisco attractions. Mingle over a casual, family-friendly Christmas buffet, or sit down to a 4-course dinner of delicious holiday dishes. This San Francisco cruise is a great way to treat your family to something different this Christmas. On the evening of Christmas Day, step aboard your vessel at Pier 3 and be welcomed with a glass of Champagne. Chose between Hornblower’s California, a luxury 183-foot yacht with elegant dining rooms, spacious salons with brass and mahogany finishing, expansive promenade decks, and a rooftop viewing area or the Hornblower's San Francisco Spirit, a sleek 150-foot luxury yacht . Plus it's decked out with festive holiday decorations and live music to set the mood with your favorite Christmas songs. From the outdoor deck or cozy indoor cabin, watch as the San Francisco skyline spreads out before you, the sun making its way toward the horizon. 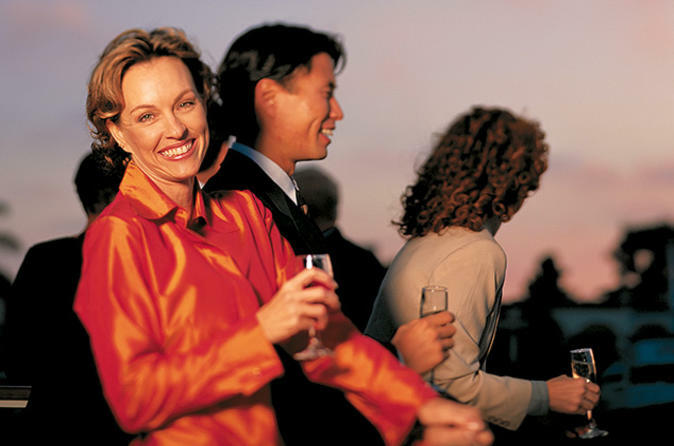 Sip cocktails and mingle with friends, family, and your fellow cruisegoers as you glide along beautiful San Francisco Bay. Drift past iconic San Francisco landmarks including Alcatraz Island, Coit Tower, the Transamerica Pyramid, the Bay Bridge, the Palace of Fine Arts, Crissy Field, and the Golden Gate Bridge glowing red in the evening light. In addition to your welcome glass of bubbly, enjoy complimentary soda, tea, and coffee, with alcoholic drinks and other beverages available for purchase. You’ll be presented with a lovely Christmas buffet of salads, seasonal entrees, hearty side dishes, and festive desserts (see Itinerary for full sample menu). This buffet dinner option is a more casual experience, perfect for families and those looking to mingle. For a more formal experience, featuring a similar menu but with a gourmet flair, choose the seated dinner option. Follow your Champagne aperitif with unlimited beer, wine, and cocktails from the premium open bar. Then head to the Captain's Lounge, and sit down to an elegant 4-course meal of holiday favorites that cater to a more refined palate (see Itinerary for full sample menu).